With the greatest number of important ports and solid performance from each, this is the Thunderbolt dock most people should get. *At the time of publishing, the price was $218. An affordable alternative that performed as well as any other dock in our speed tests but has fewer ports. Elgato’s Thunderbolt 2 Dock is a strong competitor to the OWC dock, performing similarly in our tests. It has two fewer USB ports than our top pick and no FireWire, but it ships with a short Thunderbolt cable (something you pay extra for with the OWC dock) and a software utility for both Mac and Windows that lets you eject all the connected peripherals at once. I was the accessories editor at iLounge for a little more than three years. During my tenure, I reviewed more than 1,000 iOS and Mac products, including numerous docking solutions. My editor, Dan Frakes—who also helped with the testing for this guide—spent more than a decade reviewing gear and coordinating accessory coverage at Macworld. I also spoke to Roman Loyola, a senior editor at Macworld who has covered technology since the early 1990s and wrote a comprehensive guide comparing Thunderbolt docks. A Thunderbolt dock is convenient if you move your laptop to and from a desk with multiple peripherals, if your Thunderbolt-equipped computer doesn’t have enough ports and connections, or if those connections are inconveniently located. A Thunderbolt dock isn’t a necessary purchase for many people. If you have a computer with a Thunderbolt port, a Thunderbolt dock lets you connect a slew of peripherals—via a slew of connection types—to that computer using a single Thunderbolt cable, making it a perfect option for someone who needs to connect to an array of peripherals at a desk without plugging and unplugging every cable every time. If you use a laptop as your main machine, and regularly move that laptop to and from a desk with multiple peripherals—drives, input devices, a printer or scanner, and even an external display—you can leave all of those accessories plugged into the dock, so when you sit down at the desk you can simply plug a Thunderbolt cable into the laptop to instantly connect everything. 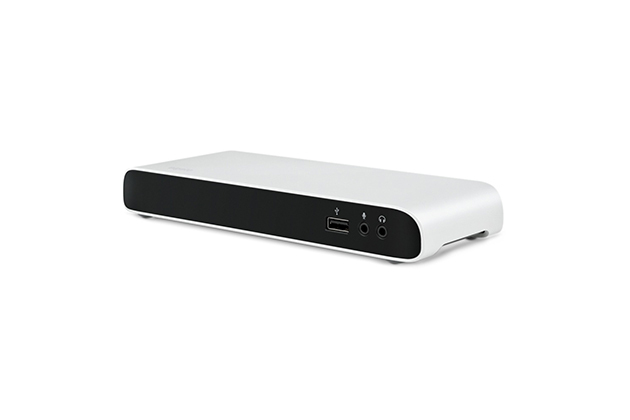 A Thunderbolt dock is also useful if your Thunderbolt-equipped computer—laptop or desktop—doesn’t have enough ports and connections, or if those connections are inconveniently located. You can run a single Thunderbolt cable from the computer to the dock, and put the dock somewhere more accessible. A dock is different from a hub, which simply gives you more of a single type of port. We haven’t seen any Thunderbolt hubs, likely because Thunderbolt lets you daisy-chain peripherals. Should you upgrade if you have an older Thunderbolt dock? 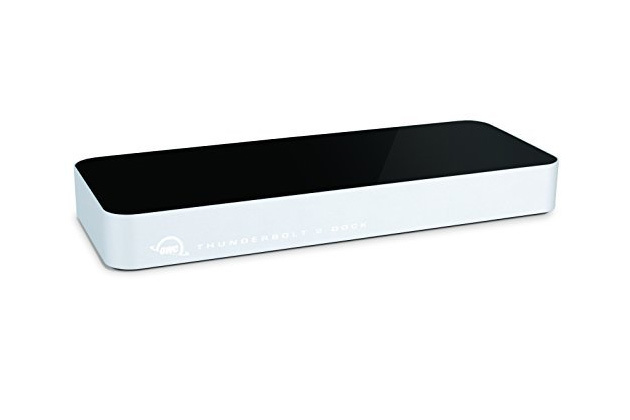 A great Thunderbolt dock extends the functionality of the computer that it’s connected to by offering the most additional connections at the fastest speeds. These docks are particularly useful when used with computers such as the MacBook Air with a limited number and variety of ports—a single cable from the dock to the computer adds a ton of functionality—but they’re also useful as a way to make it more convenient to connect peripherals to a desktop or laptop computer. Our research began with a few blog posts comparing Thunderbolt 2 docks, particularly at Macworld and iMore. Extending our search out to Amazon, Best Buy, Apple’s website, and general Googling, we found that the existing articles did a good job of including what’s out there: We found only eight Thunderbolt 2 docks on the market, all but one in the same general price range, from about $200 to $250. Looking at the available models and how people might use them, we came up with some minimum requirements in terms of ports and connections. Specifically, each dock had to have Ethernet, video output, a pair of Thunderbolt ports (one for connecting to the computer, another for connecting peripherals), and three or more USB 3.0 ports. These criteria knocked out two contenders: AKiTiO’s Thunder2 Dock (which lacks Ethernet and HDMI and has only two USB ports) and HighPoint’s RocketStor 6351A Thunderbolt 2 I/O Dock (which has no HDMI and only two USB 3.0 ports). Belkin’s Thunderbolt 2 Express HD Dock has the necessary number of ports, but at nearly $300 when we originally tested, it was considerably more expensive than the competition with no advantages, so we also dismissed it. Macworld’s Roman Loyola agreed that the price-to-feature ratio is the most important thing to be looking for with these accessories. The Thunderbolt 2 docks we tested, from top: CalDigit’s Thunderbolt Station 2, StarTech’s Thunderbolt Laptop Station, Elgato’s Thunderbolt 2 Dock, Kanex’s Thunderbolt 2 Express Dock, StarTech’s Thunderbolt 2 Docking Station, and OWC’s Thunderbolt 2 Dock. This left us with five Thunderbolt 2 docks to test: CalDigit’s Thunderbolt Station 2, Elgato’s Thunderbolt 2 Dock, Kanex’s Thunderbolt 2 Express Dock, OWC’s Thunderbolt 2 Dock, and StarTech’s Thunderbolt 2 Docking Station. We also included StarTech’s Thunderbolt Laptop Docking Station, a Thunderbolt 1 dock, as a control of sorts to see if a less expensive dock with older technology might be a suitable option. We used a 15-inch MacBook Pro (mid-2015 version) as our test machine along with a few high-end pieces of hardware. To evaluate Thunderbolt and USB 3.0 data transfer speeds, we used an Elgato Thunderbolt Drive +, an external solid-state drive. It’s the fastest portable drive out there, according to CNET, and it also happens to have both ports. (There are faster pro-level drives on the market, but if you’re using those drives, we don’t know that you’ll be connecting them through a dock.) For our 4K video tests, we connected a BenQ BL2711U 27-Inch IPS 4K Monitor. For consistency, we connected each dock to the MacBook Pro using Apple’s Thunderbolt Cable. During our testing, we first established baseline speeds for Thunderbolt and USB 3.0 connections by connecting the Elgato drive directly to the MacBook Pro and running a 16GB read/write test in AJA System Test; we repeated this three times via a Thunderbolt connection and three times for a USB 3.0 connection to get the average transfer rates. For Thunderbolt, the average read speed was 323.3 MBps, and the average write speed was 294.4 MBps. Using USB 3.0, the figures were actually higher: 378.8 MBps for read, and 325.8 MBps for write. We also connected the BenQ display directly to the MacBook Pro to verify that the computer could handle 4K video, which it did with no issue. We then repeated these tests with each of the docks in succession by connecting the Elgato drive to the dock’s spare Thunderbolt port, and then a random USB port on each dock. The docks performed much the same: Thunderbolt read speeds ranged from 315.6 MBps to 325.3 MBps. Write speeds were between 260.9 MBps and 266.7 MBps. For USB 3.0, read speeds were between 304.6 MBps and 314.8 MBps, while write speeds ranged from 247.2 MBps to 254.7 MBps. As you can see in the chart below, a direct connection to the Mac was faster in every case, but between the docks, there were no huge differences. We also tested the charging speed of each USB port by plugging in an iPad Air 2 connected to a PortaPow USB Power Monitor (ours is a slightly older model than the linked version). Our next test was to evaluate the speed of each dock’s Ethernet port. We did this by plugging the dock into another computer with Gigabit Ethernet (specifically, a 2010 iMac) and launching Network Utility on the MacBook Pro. (Among Network Utility’s features is a display of the current connection speed.) Each dock showed link speeds of 1 gigabit per second, exactly what we were looking for. To test FireWire, we plugged in an SSD-equipped version of OWC’s Mercury Elite Pro mini and measured the transfer speed. We didn’t test eSATA speeds because it’s simply not that important a port. Finally, we tested each dock’s audio inputs and outputs by plugging headphones into each of the dock’s audio jacks, making sure the input or output source was properly set in OS X and monitoring the resulting audio levels. If music was playing through the earbuds, it meant that the dock’s audio-out jack worked, and if our voice was picked up loudly and cleanly, the audio-in jack worked. A rear view of the OWC Thunderbolt 2 Dock. OWC’s Thunderbolt 2 Dock is the best Thunderbolt 2 dock for most people because it has every feature we consider to be important, the best array of ports, and a price that’s similar to that of the competition. It has more USB 3.0 ports—the most used peripheral port—than any other unit we tested, plus other necessary inputs and outputs. All of its data ports transmit at the fastest rates, and it packs all of this into a package that’s about the same size as every other Thunderbolt 2 dock. 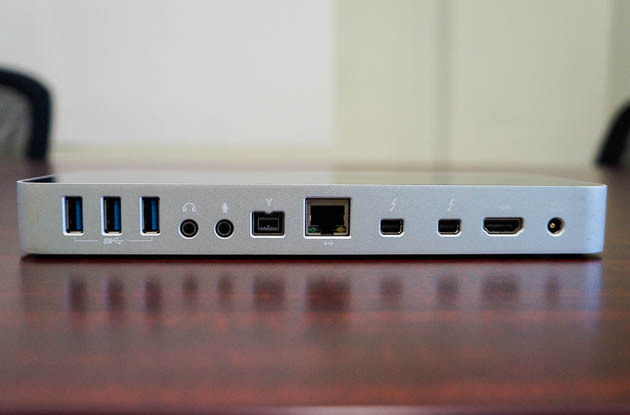 The OWC dock has a total of 12 ports: five USB 3.0 ports (two on the side, three on the back), audio in, audio out, FireWire 800, Gigabit Ethernet, two Thunderbolt 2 ports (one for connecting to the computer, and the other for connecting peripherals), and an HDMI port. Like every other dock we tested, it relies on an external power supply. The OWC dock’s side-facing ports charge USB devices faster than those on the back. The OWC dock’s five USB ports amount to two more than on our runner-up and most of the competition. We think the extra USB ports, along with a FireWire 800 port, will be more useful for most people. USB devices are ubiquitous, of course, and while FireWire 800 is all but deprecated, it was a feature found on many external hard drives, especially those aimed at Mac users (who make up much of the market for Thunderbolt docks). eSATA, on the other hand, has a more limited appeal, as few consumer-level drives or accessories use the port. All the docks we tested performed essentially identically, so which to choose depends largely on features and price. OWC’s dock did very well in our speed tests, though so did every other model, too. Its Thunderbolt read and write speed were right around the average: 323 MBps versus the average of 321.4 MBps for read, and 262.9 MBps versus the average of 264 MBps for write. The USB 3.0 read and write speeds were also in the same ballpark: The read speed of 304.6 MBps was slightly less than the 310.5 MBps average, but the write speed was higher at 254.7 MBps compared with 250.7 MBps. The bottom line is that all the docks we tested performed essentially identically, so which to choose depends largely on features and price. 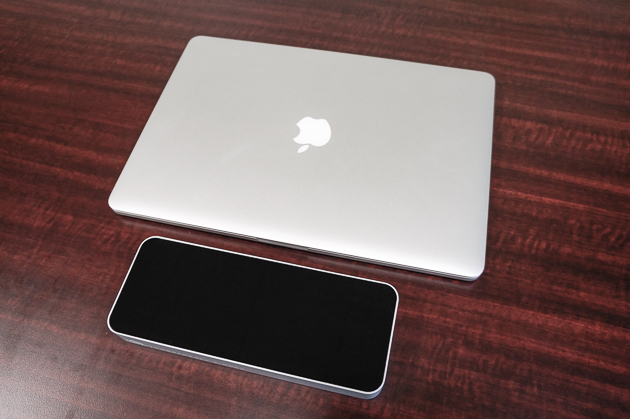 The size of our pick compared with a 15-inch MacBook Pro with Retina display. The OWC dock’s USB 3.0 ports also provided a higher total current than the competition, meaning they’re better suited to charging smartphones, tablets, and other accessories. Its two side-facing ports provide up to 1.5 amps, which isn’t particularly impressive compared with stand-alone USB chargers, many of which provide up to 2.4 amps per port, but it’s as high as the USB ports on any other dock. The three USB ports on the back of the OWC dock put out up to 1 amp. Together, the five ports offer a total of 6 amps, compared with 4.5 amps for the dock with the next highest output. The OWC dock in action. The other tests we conducted didn’t produce any terribly exciting results, but they did prove that the OWC dock lives up to its claims. 4K video via HDMI? Check. Gigabit Ethernet speeds? Check. Audio in and out? Check and check. We couldn’t compare the dock’s FireWire speeds against any other dock, because no other dock has the port, but the average throughput of 81.4 MBps read and 76.1 MBps write are just a hair below the standard’s potential. There aren’t many in-depth reviews of the OWC Thunderbolt 2 Dock, but those we found were generally positive. A Macworld review says, “Compared to the other docks in this roundup, OWC offers a whole lot of dock” for its price. When we spoke to Roman Loyola, the author of that Macworld piece, he reiterated that he likes that you get so much for your money with the OWC dock. The OWC Thunderbolt 2 Dock doesn’t come with a Thunderbolt cable, but OWC sells a one-meter cable that’s highly rated and reasonably priced. In long-term testing of the original OWC Thunderbolt 2 Dock, a previous pick, we experienced intermittent connection issues. Sometimes our external display would flash on and off, while other times everything plugged into the dock would disconnect from our computer (as evidenced by the messages on our computer chastising us for not properly ejecting our drives). The same thing happened with a replacement unit, and despite the repeated efforts of OWC’s helpful customer service representatives, we weren’t able to fix the problem. Other customers—including some Wirecutter readers—reported the same issue. As a result, we changed our pick to the Elgato Thunderbolt 2 Dock, which didn’t exhibit this issue. After several months, OWC notified us that the company had discovered the cause of the issue. As Ron Dritlein, OWC’s director of product development, explained to us, “a component on the [printed circuit board] was being interfered with from certain cellular (LTE) frequencies (possibly other sources as well)…Once we discovered that, we made an update to the PCB changing out the part to one that is not affected by this interference.” After testing the updated model for over a month without a problem, we’re confident that the problem has been fixed. As a result, we again made the OWC dock our top pick. Elgato’s Thunderbolt 2 Dock is a good alternative if the OWC dock goes out of stock or its price shoots up. The two docks are laid out in the same horizontal orientation. Elgato’s dock has only three USB 3.0 ports, as opposed to the OWC model’s five, but the average read and write speeds were about the same between them. 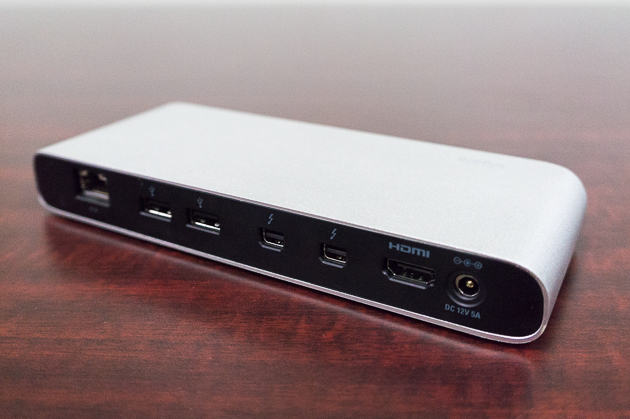 We also like that all three of the Elgato dock’s USB ports charge at 1.5 amps, which means there’s no “slow” port. It lacks a FireWire 800 port, but that’s not a huge deal for many people. We used the Elgato exclusively for several months of long-term testing and found it to be incredibly reliable—we didn’t have a single disconnect during that time. Intel announced in June 2015 its plan for Thunderbolt 3. Instead of a Mini DisplayPort-style connector, Thunderbolt 3 uses a USB-C connector, which, according to Intel, “is small, reversible, and fast, supplies power, and allows other I/O in addition to USB to run on it.” The new standard supports speeds of up to 40 Gbps, dual 4K output, and 100-watt charging. Apple has introduced its new MacBook Pro lineup with Thunderbolt 3 ports. Though these laptop models aren’t the first computers to adopt the new standard, they are likely to become the most popular. Thunderbolt 3 products started shipping at the end of 2015, but they’re still relatively rare. We’re researching Thunderbolt 3 docks and accessories, and we’ll update this guide when we have picks. But know that USB-C docks providing an interesting and lower-priced alternative to Thunderbolt docks that are already available, and we’ll be exploring both in the near future. In November 2016, OWC announced its Thunderbolt 3 Dock, a version of our top pick that is one of the first models to support the new standard. The dock has two Thunderbolt 3 ports, five USB 3.1 ports, an SD card reader, Gigabit Ethernet, FireWire 800, Mini DisplayPort, and analog and S/PDIF audio outputs. It’s available to preorder now, and it will ship sometime in February 2017. 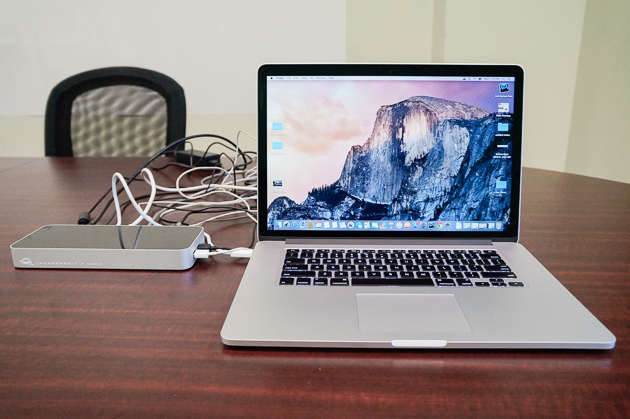 CalDigit’s Thunderbolt Station 2 performed well in our tests. It has the slowest average Thunderbolt write speeds, but the difference is small enough that it shouldn’t determine your buying decision. On the other hand, it has fewer USB ports than our top picks, and while it packs eSATA, we don’t find that connection to be as important for most people. We do like the size and shape of this one: Unlike all the horizontal docks, this one stands up vertically, so it takes up less space on a desk. StarTech’s Thunderbolt 2 Docking Station originally seemed to be a great alternative for about the same price as the OWC dock, and it was our former runner-up. The StarTech dock’s port array is a little different—we’d say it was less impressive—but it has the second-most USB ports of any dock out there. To our disappointment, it exhibited the same kind of disconnection issues as the original OWC dock over long-term testing. 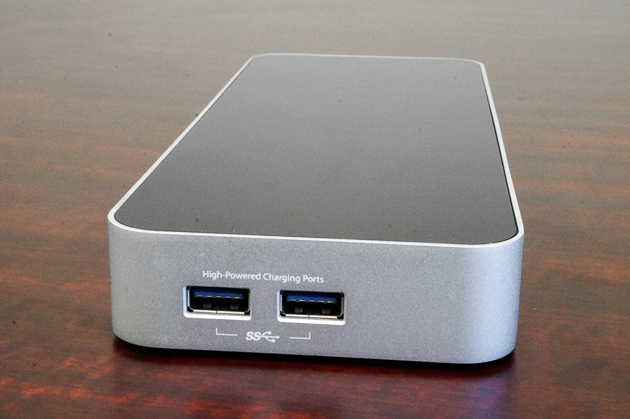 Kanex’s Thunderbolt 2 Express Dock also has only three USB 3.0 ports. It performed well, but it just doesn’t beat our top picks in terms of the quantity of inputs and outputs or price. 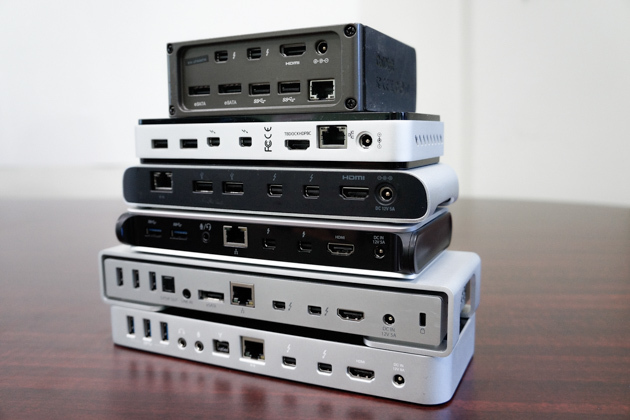 We ruled out two docks before the testing phase simply based on the ports they have—or rather, don’t have. AKiTiO’s Thunder2 Dock has only two Thunderbolt ports, two USB 3.0 ports, two eSATA ports, and a FireWire 800 connection. Compared with the other models we tested at around the same price, it’s simply lacking. HighPoint’s RocketStor 6351A Thunderbolt 2 I/O Dock packs two Thunderbolt ports, two USB 3.0 ports, Ethernet, and eSATA. It doesn’t have HDMI output. Belkin’s Thunderbolt 2 Express HD Dock is much more expensive than any Thunderbolt Dock we tested without any compelling advantages. We tested StarTech’s Thunderbolt Laptop Docking Station to see if it might be worth saving a few bucks by going with a Thunderbolt 1 dock, even with a Thunderbolt 2 computer. In terms of performance, it was actually right in line with the Thunderbolt 2 docks. However, we weren’t able to get 4K video to our BenQ test monitor, and the dock has only three USB ports. We think it’s worth spending a little more on one of our top picks. Iogear’s Thunderbolt 2 Docking Station is appealing at first glance, but our testing revealed some problems. It has just three USB 3.0 data ports, with a fourth USB port for high-speed charging—but only to around 1.7 amps, not 2.1 A or 2.4 A as we prefer. It also has no FireWire or eSATA ports, but it does include the rest of the expected connectors. We experienced no disconnections during our testing, but we did find that with this model our monitor took longer to wake up than with the OWC dock. We also heard a frequent and annoying popping sound from connected speakers; the problem persisted even after we switched to a different cable.